A phase diagram displaying binodal (coexistence) curves as well as spinodal curves, and lower (LCST) and upper (UCST) critical solution temperatures. In thermodynamics, the binodal, also known as the coexistence curve or binodal curve, denotes the condition at which two distinct phases may coexist. 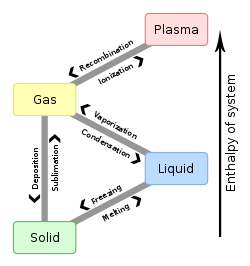 Equivalently, it is the boundary between the set of conditions in which it is thermodynamically favorable for the system to be fully mixed and the set of conditions in which it is thermodynamically favorable for it to phase separate. In general, the binodal is defined by the condition at which the chemical potential of all solution components is equal in each phase. The extremum of a binodal curve in temperature coincides with the one of the spinodal curve and is known as a critical point. In binary (two component) mixtures, the binodal can be determined at a given temperature by drawing a tangent line to the free energy. Redhi, Gyanisavan Govindsamy (2003). "5.7 Fitting Mathematical Equations to the Binodal Curve Data". THERMODYNAMICS OF LIQUID MIXTURES CONTAINING CARBOXYLIC ACIDS (PDF) (Ph.D.). University of Natal, Durban, South Africa. p. 123. Retrieved 22 July 2018. This page was last edited on 7 November 2018, at 08:58 (UTC).